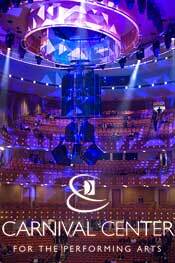 The Carnival Center for the Performing Arts opened its doors as Miami's newest and most extravagant venue. After three years of construction, this state of the art facility designed by Cesar Pelli, celebrated its opening with an elaborate week long celebration. Situated in downtown Miami the facility can be seen from the waterfront adorning the Miami skyline along the American Airlines Arena and the Bayfront Park. The venue features not one but tree separate state of the art halls. A concert hall, an opera, ballet house, and a theater, in addition to a spacious public plaza. The structure is massive, and the visual impact when approached can not be denied. It is unlike any other structure seen in this city. The visual impact does not stop at the entrance, once inside you are bombarded with fantastic murals by Jose Bedia, an outstanding local artist. This facility clearly is a cultural beacon for the city's Arts and intends to represent the outstanding cultural and diverse artistic talents it possesses. "The projects are such an integral part of the building that it really puts the visual arts in the forefront," says Ivan Rodriguez, director of the Miami-Dade Arts in Public Places, which commissioned the works. A star studded red carpet event held the evening of October 5th, 2006, was the pinnacle of the week long events. This ticketed concert was held on the facilities 2,200 seat main concert hall "James L. Knight Concert Hall." The Hall is built with an adjustable acoustic system designed by Artec. "This Hall is equipped with 84 solid concrete doors that can be closed or opened to control reverberation as well as a 130,000 pound canopy directly above the stage that can be lowered or raised to direct sound. These are some of the design elements that give this Hall a flexible acoustic environment", explains Russell Johnson; CEO of Artec. The evening was a star extravaganza. The opening ceremony was led by Governor Jeb Bush and City Mayor Manny Diaz. Shortly after the ceremony, the guests for the evening show started to arrive. Attendees who walked the red carpet this night included Albita, Emilio Estefan, Cachao, Jose Carreras, Gloria Estefan, Andy Garcia, Quincy Jones, Bernadette Peters, Arturo Sandoval, Alejandro Sanz, Carlos Vives and many others. The show was a compilation of music representing classical to pop. 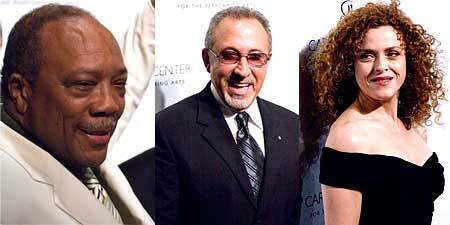 This once in a lifetime event was hosted by none other then Quincy Jones with special guests Gloria Estefan and Andy Garcia. The entire event went on without any major incidents aside from a local group of city employees taking the opportunity to create a demonstration taking a stand for better wages. The star of the night apparent to us all was the quality of the acoustics in this brand new state of the art facility. The Carnival Center for the Performing Arts will provide a new level of quality. I am certain it will attract world renowned music, ballet and opera house to come and adorn its stage.